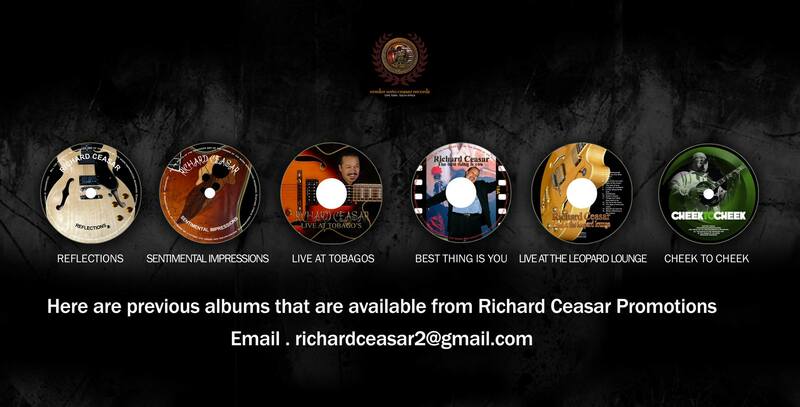 Richard Ceasar knew right from the start that he had music in him and that he was going to be a professional musician. That commitment, that drive has seen him develop into one our leading performers, particularly in the jazz genre. But did he have to make it so hard to get his name to stand out in a crowd? He married into the Schilder family! I mean, seriously? That’s music royalty in Cape Town circles. The Schilder family has given us giants on the entertainment scene – the late Richard and Tony, Chris (now Ebrahim Sohal Shibab), Philly, Jackie and the next generation Eldred and Hilton. How he managed to shine among all those bright lights, heaven knows. But he did. “I had no idea it was going to end up this way. All I know, as a teenager in Parkwood Estate, I used to walk past this house a few doors away from home and it always had cool piano sounds coming from it,” he recalls wistfully. “One day I walked past and Jackie was sitting outside. I didn’t know him but I knew he had three lovely daughters. “I thought to myself, ‘joh, die kinners nogal speak lekker English’. Ek kannie so lekker Engels praat nie, maa’ hulle is mooi kinners. For 53-year-old Richard, born in Wynberg, the seed of his music journey might have been planted a little earlier. After attending a Catholic primary school, he, fortuitously, ended up at Wynberg Senior Secondary that just happened to be one of the only “black” schools to offer music as a subject. Ceasar shows a tender touch on his favourite instrument. “But my interest in music might have started before that. I’m half Filipino, that’s where the music comes from, the Filipino side,” he said. “I had a few uncles, we call them campfire guitar players; there’d be a bit of a sing-along when they had a few drinks under the belt. I ended up in that environment. I asked the one uncle to show me a couple of chords and from there I knew it was something else, I could ‘hear’ music. It has been a slow progression to where he is today. He too did the campfire guitar player routine, followed by everyone inviting him to their huis parties to play a couple of songs before he made his first step to a formal gig. 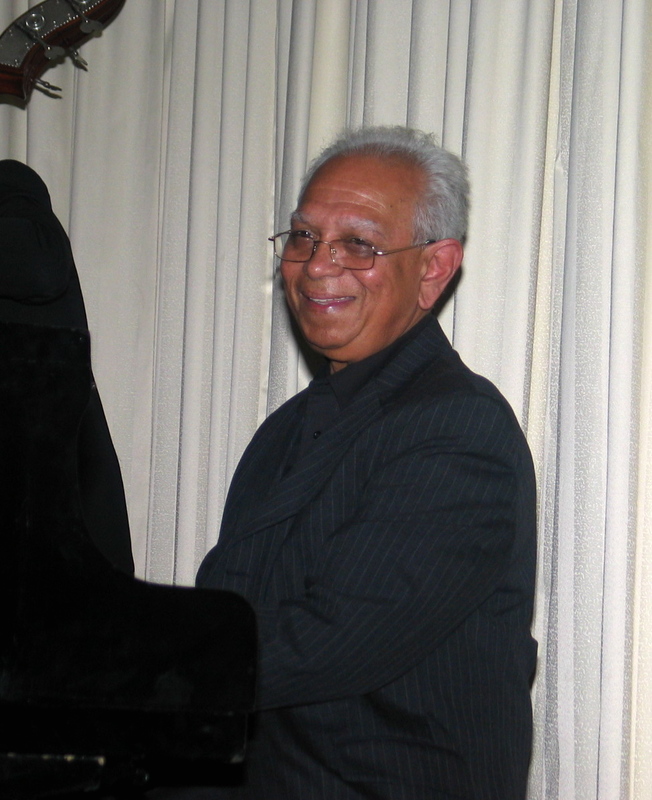 Richard’s early formal education in music was entirely classical, both at Wynberg Senior Secondary and the two years he studied music at UCT. “There was no pop or jazz. Up until 1985, I only played classical guitar,” he said. As his interest in the guitar grew, he realised there were other aspects he had to address apart from the music side. At first it was all about chords. Then it dawned on him . . . in Cape Town you can survive as a guitar player, but you stand an even better chance if you play the guitar and can sing. “People always asked if I could sing once I tell them I was a guitarist,” he said. “I couldn’t sing as I can now. I took my cue from that. My schooling was in Afrikaans and I grew up in an Afrikaans environment. When you sing your diction has to be right otherwise you sound like this (and he gives a flat impression of Stevie Wonder’s I Just Called To Say I Love You). You get the picture? He credits the Schilders with giving him his first exposure to the type of music that he would end up playing. “Bear in mind, I was playing classical guitar at the time. I thought ‘oh my god, is this what a guitar must sound like’. It was like being born again, it was a revelation for me. I changed my technique when I heard Breezin’. I knew this was the way I wanted to play. “I was learning licks on radio stations and hoping that George Benson would play on the night. That was my learning curve. 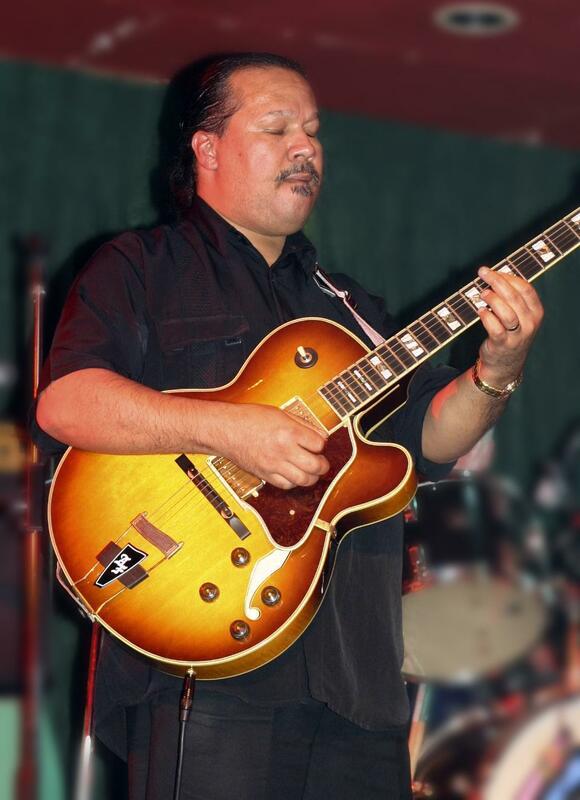 Richard’s stint at the Pig ’n Whistle attracted the attention of other Cape Flats musicians. “A lot of people came to the Pig and word got out that there was this ‘hot’ guitar player there. I wasn’t even ‘hot’ in my mind. I would be mixing the classical stuff with the theme from Deerhunter and then I would switch over. “What I did notice was that people paid even more attention to what I was doing when I sang. That is how I acquired a bit of a repertoire for the voice. 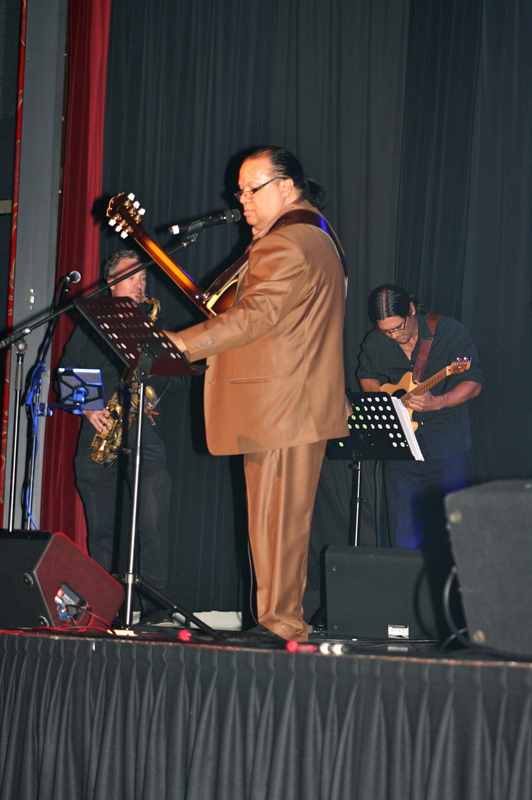 What the gig did bring him was to the attention of Cape Town’s legendary jazz drummer, Monty Weber. “I can’t recall where we met, but he asked me to join his band. That was the first band I played in and at various times it included guitarists Paul Petersen and Issy Ariefdien and Onyx Phillips on piano. “I stayed with Monty’s group, Concert Boulevard, for quite a while. They were the top group going around at that time. As an aside, just to drive home the Schilder connection, Richard says brothers Derek and Anthony Africa were also in the band and they were related to the Schilders because “Ma” Schilder was an Africa. In-between gigs with Monty, Richard would hook up with an English piano player Gerry Spencer who played at times with bassists Basil Moses and Gary Kriel, and saxophonists Winston Mankuku and Ezra Ngcukana. Although Richard didn’t finish his studies at UCT for his licentiate, he says the two years he was there were very rewarding. He says those years UCT was still “verkrampt with boere in all the positions”. “I just felt I didn’t belong there. There was no jazz program for starters. But the two years was good for me. I learnt about harmony and about ear training and all those things you get in a higher learning situation. “After two years – and I was gigging at night all the time – I came to the conclusion that if I finished my studies all that was going to happen was that I would become a music teacher or work in some crummy department in the education system. “I just didn’t see myself doing that. I thought no, I wanna be a musician. This is what I wanna do for life. I’m gonna make my bed and lie in it. There were times when I never had gigs, dan gaan dit maa’ skraal . . . but you hang in there. Richard left Monty’s band and went to Mmbatho Sun in 1984 with Durban drummer Philip Meintjies and they had Vicky Sampson as their vocalist. It brought him exposure on the Sun hotels circuit and he became more in demand as a singer. The advantage he had over most entertainers was that he could also play the piano that he had to learn at UCT. His focus was becoming an accomplished jazz musician but reality dictated other things. “Back then, jazz was the only thing that mattered to me. I was totally converted to it. Yet, I knew that if you wanted to survive in South Africa you couldn’t just be a jazz musician. I had to go between both styles. If it was a jazz gig I’d do it, but I knew there would be minimal pay coming in. If it is a pop gig – private functions are like pop gigs – the money was good. Most people would liken his guitar playing to a George Benson style but Richard disagrees. 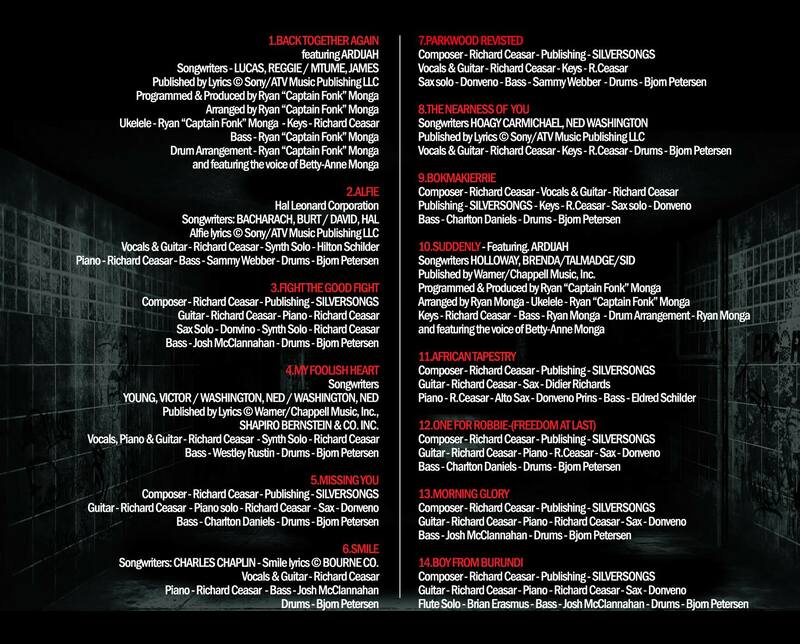 Richard has also been a prolific writer and recording artist. He admits that he compromised his standards and what he believed in musically in the early days, but those days are past now. He has no set routine when he is composing music, mainly “it just happens”. “Sometimes I get a whole tune that goes through my head in a flash. Once I was sitting in the traffic on the M5. This tune went through my head and I thought to myself, this is quite nice. So I sang it on my phone, took it straight into my little home studio and I laid down the parts. That was a geluk skoot. I don’t know how that happened. I can’t explain it. “That M5 song is called Daniel’s Dilemma. I was thinking about this percussion player Daniel Bloem of Holland. He plays with all the best musicians, like Simply Red. He went back to Holland and I was wondering whether he was going to make it, that was his dilemma. 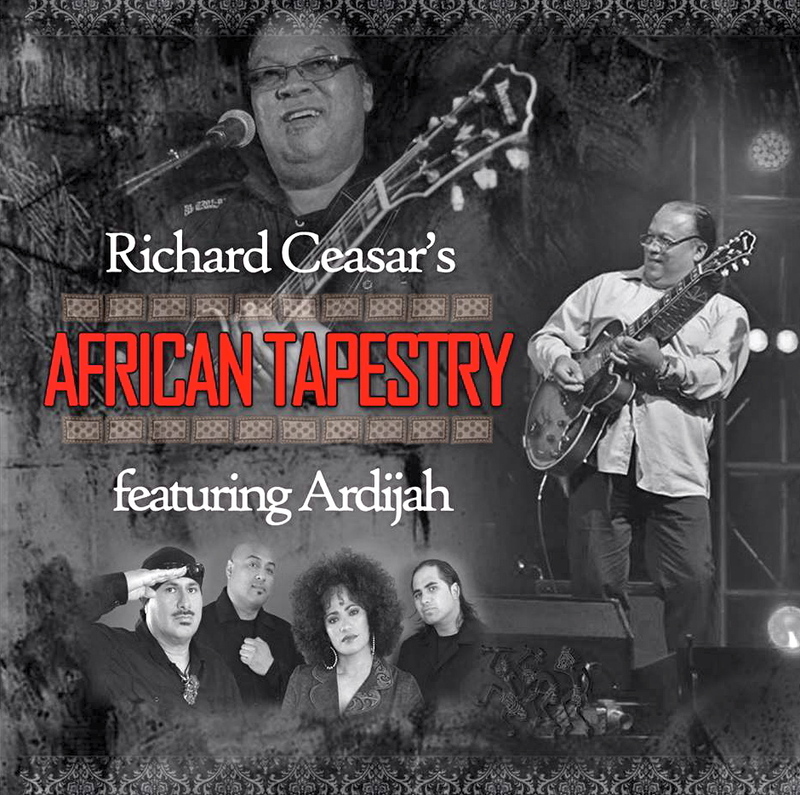 Richard’s is pretty chuffed with his latest album, African Tapestry. He spent a bit of money on producing it and regrets not bringing a supply with him when he played to a packed at Beryl Segers’s gig in Sydney last month. He had them eating out of his hands as he belted out their favourite songs. On African Tapestry, he says it was a case of coming back to his roots and his environment. “I ended up writing a song called Bokmakierie. I just thought it had a nice ring to it and everyone knows where Bokmakierie is. It is a bit of acknowledgement of the local influences in my life. One or two songs have a distinct ghoema feel to it. “I wrote one for Robbie Jansen called One For Robbie (Freedom at Last). That was a ghoema sound because he is synonymous with that sound. One other project that excites him at the moment is an album in collaboration with Ebrahim Sohal Shibab called Richard Ceasar Sings Chris Schilder’s Songs. It’s the family connection. “My son Vaughan is now a guitarist in his own right and daughter Maxine is an accomplished singer,” Richard said. “They perform together at Grand West. Whenever people book me they know what they are going to get out of me. When they book my son, they know what they are going to get out of him. He says Vaughan’s introduction to the guitar wasn’t exactly smooth sailing but he is delighted with the way it panned out. “Initially he didn’t want to play guitar and told me straight, he did not want to be like me. I said, ‘man, you are from me, you are going to play, that’s what is going to happen, it is what it is’. “I left the guitar in his room and he said, ‘you can leave the guitar there, but I’m not interested’. The next day, to my surprise, I heard the twang-twang-twang coming through the amp in his room. Then he came to ask me to show him a cord. I thought to myself, ‘good shot, the guitar bug is biting you’. “He’s got it easier than I had it. I had to sit with a radio to learn to play. Although he went down the strict father-son route with his son, Richard would have other advice for any young musician who wants to make a career out of it. “You’ve got to know for certain that is what you want to do, you’ve got to believe in yourself and always surround yourself with musicians who can show you a thing or two. That’s what I did. Pianist Tony Schilder . . . Richard learnt a lot from him. Richard’s career has given him a certain standing in the entertainment industry and his opinions carry some weight. What is it then about the local scene that gets up his nose? “Well, for starters, I have a serious gripe against the radio stations. Some of them think they are doing you a favour by playing one or two of your songs. “The major stations are supposed to play 40 per cent local content. That just doesn’t happen. As a result, millions of rands go out of the country in royalties. It’s killing us. Our music is not being heard. If they played our stuff more, we could possible make a decent living as professional musicians. That’s my No 1 gripe. He’d also like the Cape Town audiences to understand the different styles of music a little better. “There those who come to listen and see how good you are. And then you get the audiences who come to have a good time. They want to jol . . . a beer in one hand and a cigarette in the other. All you have to play is ‘jazz’, which is not even jazz. Although he has issued seven albums, he doesn’t think it is going to bring much him financial gain. “There are fewer record shops and everyone is getting their stuff off the internet with free downloads. Richard has one other box that he wants to tick – an acknowledgement to his Filipino roots. “I was thinking of doing something, because I relate to a guy called Bataan. He brought out an album called Afro-Filipino. This material is copyrighted. Seek permission before re-publishing.